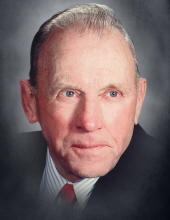 Gordon M. Sannes, age 92, passed away on Tuesday, October 16, 2018 surrounded by his family. Gordon was born on October 28, 1925 to the late Knute and Emily (Phillips) Sannes. He grew up in Scandinavia, WI on the family farm and graduated from Scandinavia High School. Following graduation, he entered the U.S. Navy, serving during WWll on an aircraft carrier. Following his discharge from the Navy, he met Joanne Fietzer in the summer of 1952. They married the following January 31, 1953. Together they lived on a small farm with their five children. Gordon worked for many years at Morning Glory Dairy, where he retired in 1988. In his free time, Gordon was proud of his time as a Scout Master for Boy Scouts, camping, and dart ball. He also enjoyed the time watching his children and grandchildren race stock cars. He was an avid Packers, Brewers and Badgers fan and loved to deer hunt with family and friends. Gordon’s most joyful times were when he was able to spend time with his family. Gordon is survived by his wife, Joanne; children: Gordon (Sharon) Sannes, Larry (Linda) Sannes, Lee (Amy) Sannes, Sandy Hornick, and Patty (Mike) Butz; grandchildren: Evan (Melissa) Sannes, Neal (Ashley) Sannes, Kellie (Adam) Huth, Julie (Brett) Buth, Amber (Jason) Smits, Aaron Sannes, Lisa (Matt) Nellis, Emily (Chad) Caelwaerts, Matt Butz and Chad Butz; ten great-grandchildren with another on the way. He is further survived by a sister, Nancy (Irv) Johnson, sister-in-law Alta Sannes, brother-in-law Duane (Rachel) Fietzer and many nieces, nephews, other relatives and friends. He was preceded in passing by his parents, son-in-law, Larry Hornick, brothers: Kenneth (Alice Jane) Sannes, Gahart (Henrietta) Sannes, Truman (Joyce) Sannes, and Norman Sannes, parents-in-law, Alvin and Myrtle Fietzer, and sister-in-law Donna (Harold) Shanklin. Friends and family may call on Friday, October 19, 2018 from 9 a.m. until the time of service at 11 a.m. at Bethany United Methodist Church, 1110 Echo Lane, Green Bay, 54304 with Pastor Robb McClintock officiating. In lieu of flowers, a memorial fund is being established in Gordon’s name. The family would like to give a special thank you to the staff at Bellin Hospital as well as Unity Hospice for their loving care and compassion for Gordon. To send flowers or a remembrance gift to the family of Gordon M. Sannes, please visit our Tribute Store. "Email Address" would like to share the life celebration of Gordon M. Sannes. Click on the "link" to go to share a favorite memory or leave a condolence message for the family.